:Let's go on a safari! What do we need? Jungle animals, of course! This Jungle World sticker set will unlock kids? imaginations as they see themselves in Africa or some other exciting jungle environment, waiting to catch a glimpse of a lion, zebra, or crocodile. While the children are ?searching? for these illusive animals, parents and teachers can use this time to teach lessons on God's majesty in creating all of these animals, environmental awareness?encouraging care for the beautiful world God has given us and the creatures He created to inhabit it with us?and more. All illustrations are taken from My Read and Rhyme Bible Storybook, by Crystal Bowman and Cindy Kenny, illustrated by Christiane Engel. 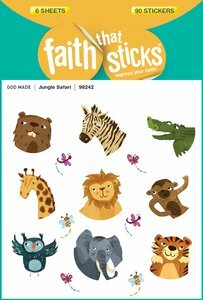 About "Jungle Safari (6 Sheets, 90 Stickers) (Stickers Faith That Sticks Series)"